The world certainly suffers no shortage of accounting texts. The many out there help readers prepare, audit, interpret and explain corporate financial statements. What has been missing is a book offering context and discussion for divisive issues such as taxes, debt, options, and earnings volatility. King addresses the why of accounting instead of the how, providing practitioners and students with a highly readable history of U.S. corporate accounting. More Than a Numbers Game: A Brief History of Accounting was inspired by Arthur Levitt's landmark 1998 speech delivered at New York University. The Securities and Exchange Commission chairman described the too-little challenged custom of earnings management and presaged the breakdown in the US corporate accounting three years later. Somehow, over a one-hundred year period, accounting morphed from a tool used by American railroad managers to communicate with absent British investors into an enabler of corporate fraud. How this happened makes for a good business story. This book is not another description of accounting scandals. Instead it offers a history of ideas. Each chapter covers a controversial topic that emerged over the past century. Historical background and discussion of people involved give relevance to concepts discussed. 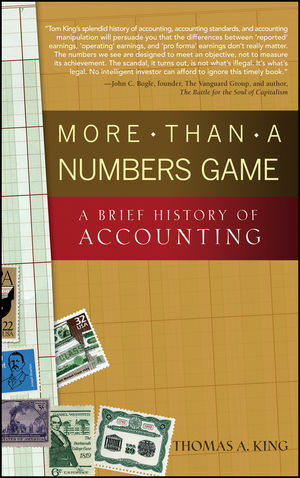 The author shows how economics, finance, law and business customs contributed to accounting's development. Ideas presented come from a career spent working with accounting information. THOMAS A. KING is treasurer of Progressive Insurance, which is regarded as one of the most innovative companies in the insurance business. He grew up in Racine, Wisconsin, and studied liberal arts at Harvard College. King worked for three years on the New York audit staff of Arthur Andersen & Co., earned an MS in accounting from New York University, and obtained CPA and CMA certification. After receiving an MBA from Harvard Business School, he joined Progressive Insurance in Cleveland. King spent ten years in marketing and general management before returning to accounting. Since then, he has served as corporate controller, investment strategist, and treasurer. At Progressive, King helped craft financial policies that support business objectives and managed investor relations when the company became the first to report monthly financial results.